Intrinsically Safe Instruments for use in Hazardous Areas Reliability Direct, Inc. Your Direct Source for Reliability, Maintenance, Test & Measurement! A hazardous area is a location where flammable vapors, such as gas, or a concentration of fine dust particles, grains or fibers may be present. This includes, but is not limited to, chemical and petro-chemical refineries and process plants, paper mills, sugar refineries, coal mines, and much more. The use of electronic equipment in a hazardous area requires strict certification. Reliability Direct offers a full line of explosion proof digital cameras for capturing video and images in a hazardous area, intrinsically safe cell phones for mobile communication throughout a hazardous area, along with explosion proof and intrinsically safe computers, infrared thermal imaging cameras, ultrasonic inspection, and vibration monitoring devices. Please Visit our Knowledge Base for More Information on Intrinsically Safe and Explosion Proof Articles! This Camera has been discontinued. Smart-Ex 01 CSA Certified mobile phone for use in hazardous environments is approved for Class I, Division 1, Groups A-D T4 and Class II & III, Div. 1, Groups E-G T4. Smart-Ex 01 CSA Certified mobile phone for use in hazardous environments is approved for Zone 1. ATEX certified for Europe and IECEx certified internationally. This Product is Obsolete and has been Discontinued. We suggest you consider the Smart-EX 01 Intrinsically Safe Smart Phone. The EX-Handy 09 is obsolete and has been discontinued. We recommend you consider the Smart-EX 01 Intrinsically Safe Smart Phone The Ex-Handy 209 Featurephone is Certified for use in Zone 2 / Division 2 hazardous environments. The TC7150 High performance 320×240 radiometric infrared camera is NRTL Certified for Class I and II, Division 2, and Class III Hazardous Locations. The Magnet-Ex 12 is an intrinsically safe pencil sized magnet probe, designed to detect magnetic fields in Ex-hazardous areas. For testing solenoid valves, relays, transformers and flow-meters in Ex-hazardous areas. The CMCP512 Explosion Proof Loop Powered Display is designed for applications where a simple inexpensive display is required. The IS-mA1 is suitable for all intrinsically safe signalling applications including fire, security and process control. 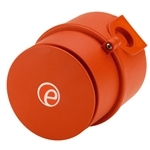 The IS-pA1 is a compact, panel mount 90dB(A) intrinsically safe alarm buzzer. 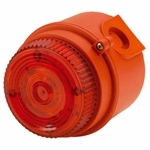 The IS-mB1 is a compact beacon with an array of six high output L.E.D's. Approvals include ATEX, IECEx and GOST-R for Zone 0 applications and FM approval for Class I Division 1 and Class I Zone 0 applications. The IS-mB1 is suitable for all intrinsically safe signalling applications including fire, security and process control.